Although the weather does not always cooperate, the work still has to be done. 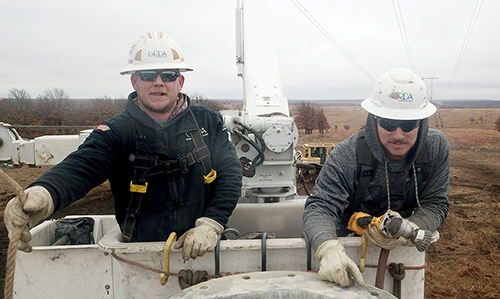 Reliable teamwork… GRDA linemen Jacob Stinson and Ryan Stickler are two members of Team GRDA who have been helping with a recent steel pole replacement project. The goal? Maintaining system reliability. There are thousands of different occupations that can attest to that. Whether it is the heat of the summer, cold of the winter or windy, rainy, conditions in between, at all hours of the night or day, crews must be prepared to tackle the job at hand. At the Grand River Dam Authority, many of our employees know this to be true. Linemen, law enforcement officers, plant maintenance personnel, mechanics and employees in many other roles face the Oklahoma weather head-on every day. Why? To continue GRDA’s reputation for reliable production and delivery of electricity. Recently, during the coldest winter weather of January, GRDA crews have been working to replace steel poles on an existing transmission line northwest of Tulsa. The conditions have been muddy and, of course, there is always the wind, but steady progress is being made. When the work is all complete, the result will be several new steel structures in place, ready to carry on the reliability mission. Of course, GRDA’s commitment to reliability is illustrated by hundreds of different tasks year-round, round-the-clock. From proper vegetation management and right-of-way maintenance during the heavy summer growing season, to proper system planning and equipment maintenance year-round, the focus is always on producing the electricity efficiently and delivering it reliably. Today, GRDA accomplishes that with a diverse electric generation portfolio comprised of gas, coal, water and wind resources and a sophisticated energy delivery system of over 1,200 miles of transmission lines. Most of all, GRDA meets the mission because of its dedicated team of 500 skilled and experienced Oklahomans. No matter the conditions, Team GRDA is working to provide the power.